Christina is Ts’msyen from Lax Kw’alaams in Northern British Columbia, Dene from Lutselk’e in the Northwest Territories, and Métis. She graduated from the University of British Columbia with an undergraduate degree in art history and later a degree in law. Christina moved to Ontario to article with Aboriginal Legal Services in Toronto, and in 2015 she was called to the bar with the Law Society of Upper Canada. Since becoming a lawyer, she has worked as a legal intern in Uganda and as a human rights lawyer in Toronto. In 2016, Christina was elected to the board of directors of the Indigenous Bar Association. From July 10th to 14th, 2017, I attended the 10th session of the United Nations Expert Mechanism on the Rights of Indigenous Peoples (EMRIP) in Geneva. Indigenous peoples and national representatives gathered in Switzerland to discuss Indigenous rights. The Expert Mechanism is an advisory body that was created in 2007 through the Human Rights Council to address human rights issues. The week began slowly, as the Centre for International Governance and Innovation’s (CIGI) International Law Research Program delegation waited to enter the UN offices in Geneva. I arrived to hear the official welcome of the UN High Commissioner for Human Rights, Zeid Ra’ad Al Hussein; the officers were elected and the agenda was adopted for the meeting of the Expert Mechanism. The agenda consisted of 10 items and each Indigenous group or national representative was invited to make an intervention. An intervention is a two to three-minute speech taking a position on a specific topic and providing recommendations for the Expert Mechanism in the formulation of their reports. Of high importance was the review of the Expert Mechanism’s new draft mandate, activities and methods of work. The mandate is currently under review and has been since 2016. 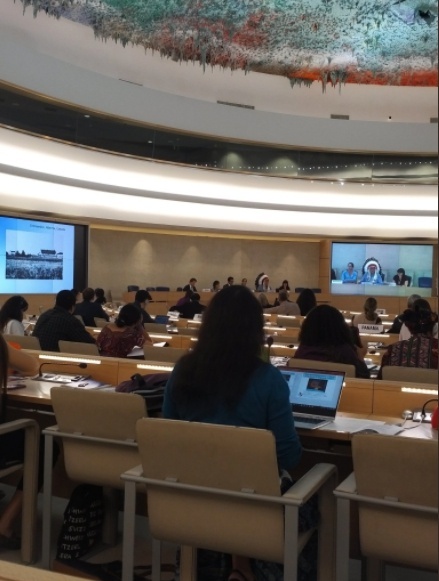 Many delegates spoke about the need for the UN Expert Mechanism on the Rights of Indigenous Peoples, United Nations Forum on the Rights of Indigenous Peoples and Special Rapporteur on the Rights of Indigenous Peoples to be fully implemented within their nation states. Delegates called for clarification and reduced overlap and duplication of the respective roles of three related mechanisms: the UN Expert Mechanism, the United Nations Permanent Forum on Indigenous Issues and the Special Rapporteur on the Rights of Indigenous peoples. Grand Cree Chief Wilton Littlechild spoke of the requirement for increased participation of Indigenous peoples at the United Nations General Assembly, calling it discriminatory for UN bodies to require Indigenous organizations to prove that they are Indigenous in order to participate. On the last open day of the UN Expert Mechanism, Chief Littlechild gave a keynote address at the beginning of the day. I felt a sense of pride to see him speak about the history of Indigenous people’s participation at the United Nations. He spoke about how he has witnessed the UN change over the past 30 years. People like Chief Littlechild and Kenneth Deer have continually called for the inclusion of Indigenous peoples in the international system. It was only in 2007 when the UN created the Expert Mechanism through the Human Rights Council. Chief Littlechild also spoke about Canada’s legacy of residential schools in Canada. In speaking about this terribly difficult experience that has affected Indigenous people across Canada, I felt a pang of sorrow. I remembered why I was at the UN Expert Mechanism. I wanted to attend because I have witnessed and experienced systemic discrimination and structural violence against Indigenous peoples. The UN Expert Mechanism is one way to redress those wrongs by engaging in a dialogue about important issues affecting Indigenous peoples. Later that morning, I gave a three-minute intervention to the Expert Mechanism on the 10 years of the implementation of the United Nations Declaration on the Rights of Indigenous Peoples on behalf of the CIGI (Centre for International Governance Innovation) delegation. This intervention engaged the metaphor that Canada consider implementing the UN Declaration by braiding domestic and International law. In the language of the CIGI intervention was the idea that Indigenous peoples need the international system as a place to dream and act untethered by domestic challenges. The intervention recommended that the Expert Mechanism refer in their report to Indigenous governments’ roles in implementing the UN Declaration. The second recommendation called for EMRIP to include reference to Indigenous laws as a source for developing national action plans. That day at lunch, the delegation from CIGI provided context to our intervention with ideas and perspectives about implementing UNDRIP in Canada gathered in a recent CIGI special report on UNDRIP. The panelists provided different contextual issues on national or regional scales on how UNDRIP could be implemented. For example, CIGI fellow Brenda Gunn, began the side event by saying that we should use the UN Declaration as a minimum baseline of rights for the interpretation of Section 35 of the Canadian Constitution.